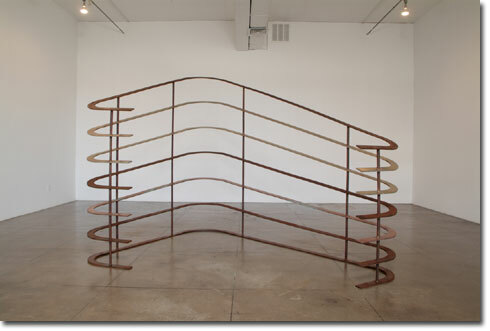 Where Martinez and Cruz articulate their ideas in complicated arguments and puzzles, Bojan Sarcevic, a native of a country that no longer exists, distills the inherent contradiction of society and socialization in one large sculpture that resembles a giant ribcage. Inspired in part by the work of German-Jewish architect Eric Mendelsohn - who designed the futurist Einstein Tower in Potsdam - "Wanting without needing, Loving without leaning" crystallizes our desire to build relationships unaffected by baser human needs. As love requires some leaning, culture requires some concessions, yet the confines of both give the individual form and function. Sarcevic, making sculpture that echoes the potential and the entropy of architecture, is in step with the return of formal aesthetic concerns, which seem like useful tools again now that our carefully segregated social orders have collapsed to reveal a vast global cacophony. The found-art fashion drawings he includes also allude to a sea shift in the idea of beauty, once rejected by postmodernists and some modernists as a type of tyranny but gaining currency again as a useful scaffolding for constructing concepts and promoting dialogue. This set of Artpace residents (three groups are selected each year by independent curators, who choose an international artist, an American and a Texan artist for the 6-week residency program), has made interesting use of their mediums of choice. Martinez exploits the boundaries of found art, painting, and sculpture, making each element a prop in his expertly directed lesson. The comparison is laden with irony, but like the Constitution, "A Meditation," is an installation that is both elastic and concrete enough to survive multiple interpretations with its integrity relatively intact. The videos in Ortiz’s installation make use of the medium as both a narrative tool and painting’s likely heir. Beautifully and lyrically constructed, the best of the two succeeds because of a cinematic staple: Ortiz’s charismatic presence. Wordlessly he conveys a range of identifiably emotions, most importantly compassion for our stand-in, while the fractured progression and array of visual allusions places the work firmly in the realm of contemporary art. Ultimately, Artpace 05.1 is compelling because Zamudio-Taylor has successfully extracted the controversial and well-worn subject of identity from narrow socio-political contexts - in which, when it is addressed at all it is usually as a demand for validation - and placed it on a universal examination table.